Front of the house showing the original home. The front section of the house was built in 1905 with two rooms downstairs and one upstairs under the eaves, built over a foundation of large squared timbers. 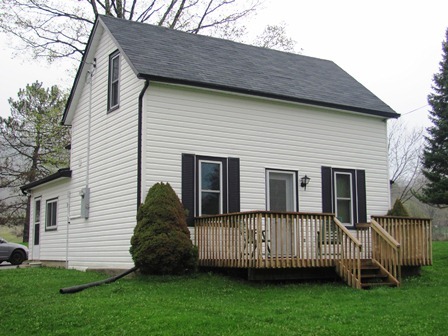 A small L-shaped addition was added fairly soon thereafter, with a small basement that now houses the furnace. It is a simple home built of basic local materials, in a manner similar to many wooden farmhouses of this era in the area. It is possible that it was built using a plan from a catalogue, as was common at the time. Chimney holes in wall and floor. The original house was heated by two wood stoves – the chimneys led through the upper rooms to provide heat. Round holes the size of large dinner plates for the chimneys are still visible upstairs in the floors and walls of both bedrooms. The original painted floor planks upstairs are of a hard, knotty wood – houses in the area used local basswood for floors. There are no adornments, carved baseboards, elegant gables or dormer windows in this house, reflecting the fairly austere existence in Grey County at the turn of the twentieth century. The door latches on the upstairs rooms appear to be hand-forged. Like all houses, this one tells the story of its inhabitants. 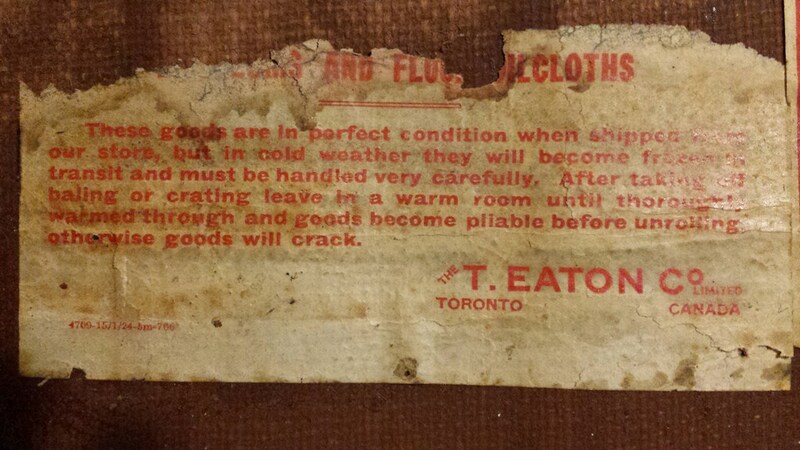 In 1924, a roll of linoleum was delivered from the Eaton Company to Miss Edith Camack at the Flesherton Station – the label was found still stuck to fabric-backed linoleum that was removed 90 years later in 2014, beneath carpet in the back bedroom. From this clue we have learned more about the original owners of the house. 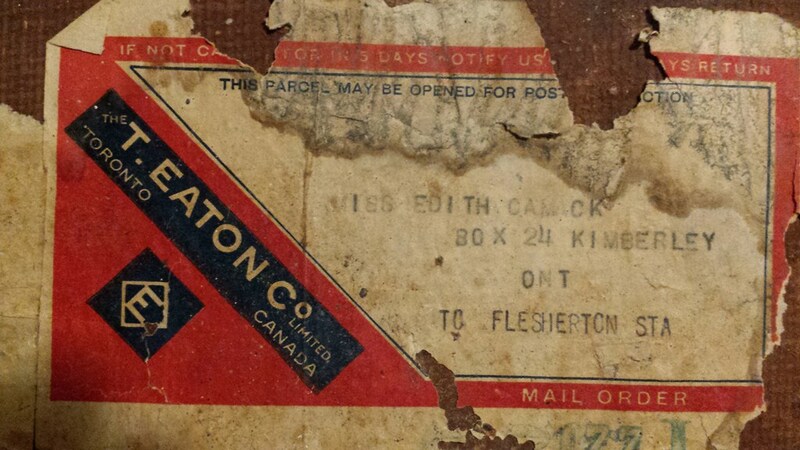 It turns out that Edith Camack, then 26, was running her 72-year-old widowed father’s house. 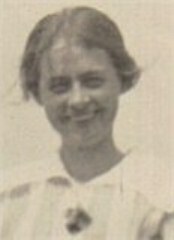 Edith Artemesia Camack (1887-1960) never married, but lived with and cared for her father from the 1920s until his death in 1943. She continued to live in the house until her death in 1960, at the age of 73. Edith’s birthday was July 11, 1887. Edith’s paternal grandparents were both from Ireland. 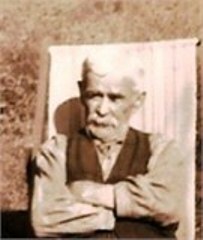 John Camack Sr. (1798-1885) and Ann Burns (1815-1889) married and settled in the Kimberley area with the first settlers, likely in the 1850s or 1860s. They had three children: John, Thomas and Sarah Ann. Edith’s father, John Camack Jr. (1851-1943) is listed in the 1911 census as a Canadian farmer of Irish descent. Thomas Camack, Edith’s uncle, married Margaret Ferguson and had seven children, while Sarah Ann married Robert James Ferguson and had four children, born in nearby Thornbury. Edith’s father, John Camack Jr, in 1943. Edith’s parents, John Camack Jr. and Artemesia Gibson married in 1882, and had a farm outside Kimberley called “Hill Crest.” By 1901 they had four children on the farm: Alice (aged 15), Edith (aged 13), John Charles (aged 11) and Nellie May (aged 7). One child, Annie Luella, died at age one year eight months in 1885. Edith’s mother, Artemesia, died in 1920 at the age of 68, leaving her husband John to live another 23 years with daughter Edith, to the ripe old age of 92. The family were Methodists, and likely first attended the Union church just a few doors up the road (where the Community Hall is now). After 1885, they would have worshiped at the new Methodist church in Kimberley. Edith’s little sister Annie Luella’s gravestone. 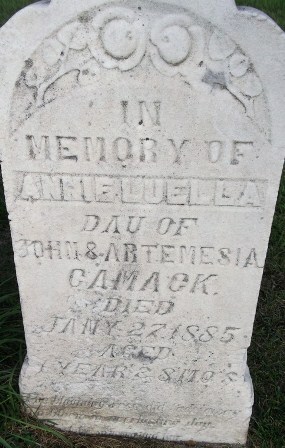 Edith’s grave is at the Clarksburg Union Cemetery in Thornbury along with the graves of the Camack family back to 1885. The grave stones have been replaced, though little Annie Luella’s original stone remains. Thomas Camack (Edith’s uncle) had a farm nearby called “Shadynook Farm” located at Country Road 13 and 3rd Concession north of Kimberley. He was noted as being a “chicken crank” because of his passion for breeding and showing poultry at the poultry fairs held in Kimberley. His farm, with a remarkably similar house to ours, was left to his son, Clifford Thomas Camack. Edith’s uncle, Thomas Camack retired to a third very similar black and white home, also located in Kimberley, when his son took over the farm. Thus both brothers, Tom and John, retired to the village after their life of farming. One might wonder if they re-used the same plan for the three houses, because they are very similar. There do not appear to be any Camacks remaining in the area, although there are still Fergusons in Kimberley. Edith’s brother, John Charles (1889-1968) married Mae Jeanetta (Nettie) Wickens (d. 1975). They had three children, Ivan Camack (d. May 30, 2014), Carmeta Camack and a daughter with the unique name of Wis Retis Camack. We know Carmeta attended Sunday school in Kimberley because her name appears on the Blue Bird Sunday School Quilt made in 1927, but at some point the family moved to Minesing (near Barrie). Upon Edith’s death in 1960 the house was purchased by the McMullens, who added the split level kitchen addition with its striking oak floor in the 1970s. They made a number of upgrades to the house but the main shape remains unchanged. 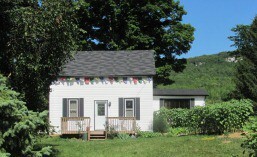 The barn, from the back of the property. 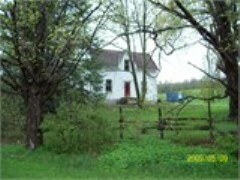 The house sits on an acre of property which contains a small barn. Actually a drive shed, it would have housed the family carriage or cutter and horses. The loft still contains hay. The barn is quite unusual in that it is two planks thick – vertical planks outside, wide horizontal planks inside. 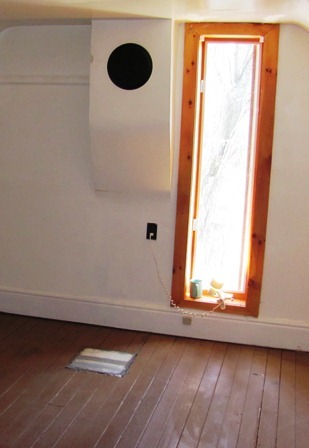 This construction minimizes the wind penetration in the harsh winters of Bruce Country, but also makes the barn very dark when its doors and shutters are closed, as there are only tiny holes between the crossed planks for the sun to penetrate. The wood may be cedar. 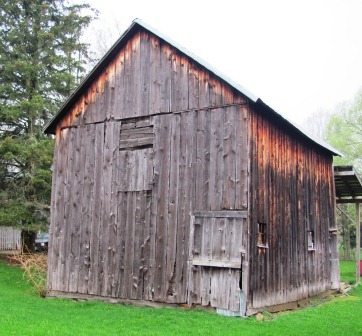 The barn sits on large squared timbers and not a stone foundation. At the back of the property runs one of many small streams that carry spring water from the Niagara escarpment to the Beaver River and hence to Georgian Bay. Learn more about history of the area.